The backwater islet of Kaavaalam has settled into an uneasy sleep. Some time past midnight they wake up to a much-awaited call: " Vellam vannoo, vellam vannoo ... (Water's here, water's here...)" Men, women and children jump into their changaadams (tiny rowboats). Across the canal, they rush to the public water tap. When the tap runs dry, they pick up their pots, sometimes half full, and return home to resume their interrupted slumber. In Kaavaalam, potable water is hard to come by. "We get piped water only twice a week; that too for an hour at a time," says Omana, a resident of the area. Kaavaalam is only one of 54 villages in the backwaters of Kuttanadu in central Kerala that face acute water scarcity. Although reasonably prosperous, Kuttanadu depends on Thiruvalla, a town several kilometres away, for the barest minimum potable water even at the peak of the monsoons. 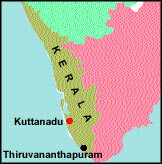 Kuttanadu, home to about 1.8 million people, is a waterlogged stretch of about 110,000 hectares (ha). About 50,000 ha of the region are 60-220 centimetres below sea level. For the better part of the year, most of the land is submerged in water. 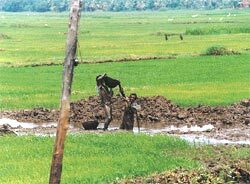 Kuttanadu has the distinction of being one of the few areas in the country where farming is carried out below sea level. Four major rivers in the state -- Pampa, Meenachil, Achankovil and Manimala -- are discharged into the region, transforming it into a vast expanse of waters. The picture perfect beauty of the land makes Kuttanadu the very essence of Kerala's backwater experience. But a boat ride around the vast and beautiful stretches of the backwaters is instructive. Women wash clothes and clean their vessels in the water even as your boat speeds by. This is also where water for cooking and drinking is collected. A number of houses have toilets with direct outlets into the canals and streams of the backwater system. Pesticides from the rice fields, waste from medical colleges and sewage from the townships of Kottayam, Thiruvalla and Changanassery give the water a dark, oily texture. Add to this the faecal waste from an average of 300 tourist houseboats. "Even a cupful of pesticide would not kill us. Our daily intake of poison through water is much more than that," says Kuttappayi of the Kainakari panchayat, Chambakkulam block. Kainakari, with over 6,000 households and 30,000 people, does not have even one public tap to supply safe water. Although the state government had commissioned a huge overhead tank in 1989, the tank has not seen a drop of water since it was built. Says E J James, executive director, Centre for Water Resources Development and Management (cwrdm), Kozhikode, more than 80 per cent of the people in Kuttanadu rely on the contaminated canal water for their daily water requirements. About 40 per cent of this number uses the water without boiling it first. Interestingly, there are people who actually prefer the canal water to piped water. Says Chandramati, a housewife from a not-so-well-off family in Arayiram Kara, Kainakari, "If food is cooked in piped water, it gets spoilt by midday, but if it is cooked in canal water, it lasts till the night." And the Sabarimala pilgrimage season brings matters to a head. With four million-odd people crossing the river Pampa to reach Sabarimala, the river turns into a cesspool of human waste, raw sewage and domestic and commercial garbage. Pilgrims who travel from outside the state to visit the hill shrine tend to defecate on the riverbanks. The faecal matter is carried into the river water. "True, some temporary steps are taken to provide basic sanitary facilities to the pilgrims. But all wastes generated spill into the river, and reach the Kuttanadu water system," complainsN K Sukumaran Nair, general secretary of Pampa Samrakshana Samiti. According to Kerala State Pollution Control Board statistics, the coliform bacteria count in 100 millilitres (ml) of water in the Pampa at Sabarimala is 200,000. When the river reaches Edathwa in Kuttanadu, the count is 48,700. No wonder then, outbreaks of epidemics like rat fever and diarrhoea have seen an alarming increase. According to statistics available with the district medical officer, Alappuzha, 10 persons died of wheel's disease in the first half of 2002. The count for 2001 was 23. The total count of those suffering from diarrhoea in 2001 was 19,570. Statistics at the Alappuzha Medical College show an increase in filariasis, schistosomiasis, typhoid, jaundice, intestinal cancer, gastroenteritis and cholera. Says R Visakhan, president of the Kainakari panchayat, "A few months back, ministers came visiting because of a cholera epidemic. After the epidemic passed, no one bothered at all. There is no attempt to address the root cause: the scarcity of drinking water." Although water supply projects, like the Kuttanadu Water Supply Scheme, have been implemented, they have failed to meet the needs of the area. Water is treated and stored in tanks in Thiruvalla and Changanassery, and is first supplied to the residents of these towns. With the towns growing in size and population, there is an increased demand in water. Result: the crunch on Kuttanadu worsens. And tubewells are no solution either. The groundwater in Kuttanadu is far too acidic. Even a few years back, most inhabitants relied on the natural ponds and tanks maintained by each household for potable water, and the canals running by the side were used for bathing and washing. However, new roads and the largescale reclamation of paddy fields for construction purposes have led to the blockage of canals at several places. Viswambharan Nair, a retired village officer in Kaavaalam, believes that matters were compounded by the arrival of the Kerala Water Authority's supply taps. "People neglected or abandoned the ponds hoping that tap water would be available through the year," he says. Developmental interventions have, in fact, only worked to hurt Kuttanadu's fragile ecosystem. For instance, the Thannermukkan bund was constructed across the Vembanad Lake in 1975. The bund was constructed to obstruct saline water intrusion into paddy fields during the dry season, and thus bolster paddy cultivation. "The natural flushing in the entire Lower Kuttanadu effected by tidal movements has ceased and water levels in the upstream region have dropped," says Madhusoodana Kurup, a fisheries expert on the Indo-Dutch team that conducted a water balance study in Kuttanadu during 1988-90. The result is that the water body tends to become stagnant, leading to water pollution. Aquatic weeds have also grown to epidemic proportions. During the last three decades, as many as 30 committees have studied and submitted reports on Kuttanadu. But so far, the authorities have taken no effective measures. "Those who formulate projects for Kuttanadu base them on the experiences of Holland, simply because Holland is also situated below sea level. This is nonsense. Climate, vegetation, the way the rivers flow...everything is different," says John Mathai, an environmentalist from Kuttanadu. M K Prasad, former head of the Kerala Shastra Sahitya Parishad, who has studied the ecology of Kuttanadu, and Father Thomas Peelianickal, vicar of Fathima Matha Church in Pulikunnu, believe that rainwater harvesting is the only possible solution to the drinking water scarcity in the area. "People think drinking water is a commodity that should be supplied by the government. This attitude should change first," says Father Peelianickal.